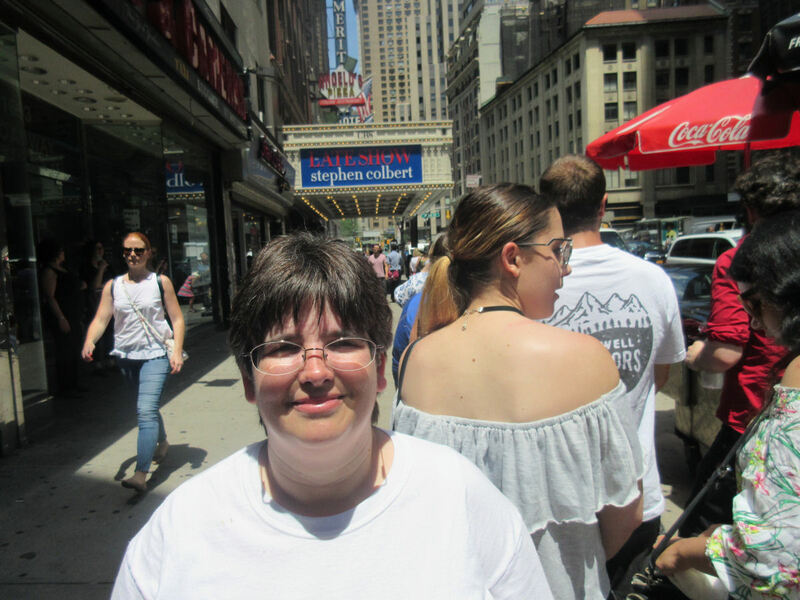 2016 NYC Trip Photos #10: Waiting for Colbert « Midlife Crisis Crossover! It’s not the same as his old Comedy Central gig, but it’ll do. For our second trip to Manhattan we decided to do something we’d never done before: attend the live taping of a late-night talk show. Tradition holds that such shows may air in the wee hours of bedtime, but they’re recorded before a live studio audience that day’s afternoon. Sadly for our chosen week, most hosts were either on hiatus or already sold out by the time I thought to look them up. I found a few TV shows that we could have attended, but none of us three had any remote interest in either Maury Povich or The View. Fortunately there was one man who’s airing new episodes this week, who had tickets available, and who wasn’t the complete opposite of us. That man was Stephen Colbert. 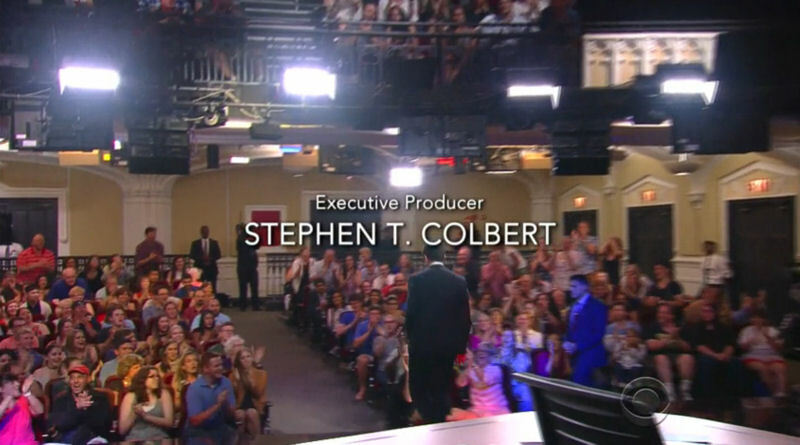 That show was The Late Show With Stephen Colbert starring Stephen Colbert. 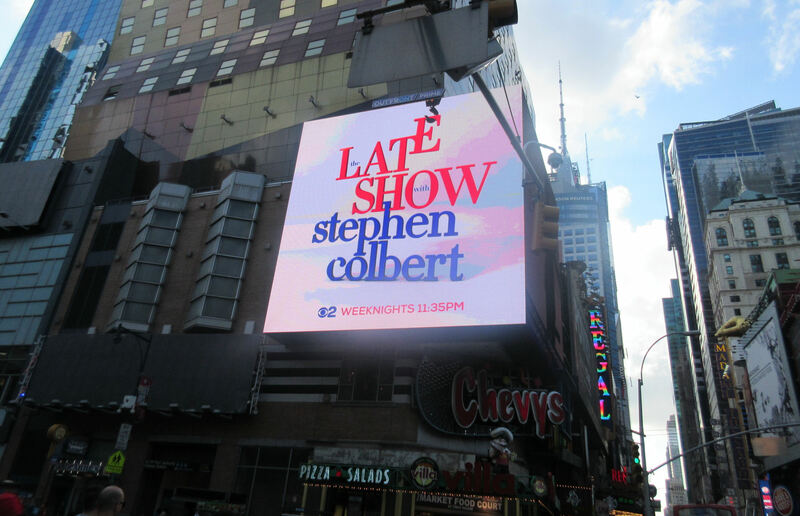 These are the results of that time we showed up to watch Stephen Colbert record the July 11th episode of The Late Show With Stephen Colbert starring Stephen Colbert. At the end of our extra-length Day Three, I typed up the preceding entry into the wee hours of that night as quickly as I could while our Colbert experience was fresh in mind. For background noise I had our hotel TV turned on while the episode aired. Listening to a series of performances we’d just watched in person added a surreal edge to my exhausted state of mind. From Chinatown we took the D train from the Grand Street Station up to 7th Avenue and arrived around 1:15 to find several dozen ticketholders already in line, getting a head start on their sunburns. Mind you, this wasn’t the line to see the show; this was the line to redeem our online tickets for actual show tickets, scheduled to film later in the day. Getting on TV is an involved process even if you’re only playing the part of Seat Warmer #216. Anne bravely waited with me in line while my son retreated into the shadows of the camera shop next door. Eventually the Earth’s rotation would bring skyscraper shade in our direction as well. 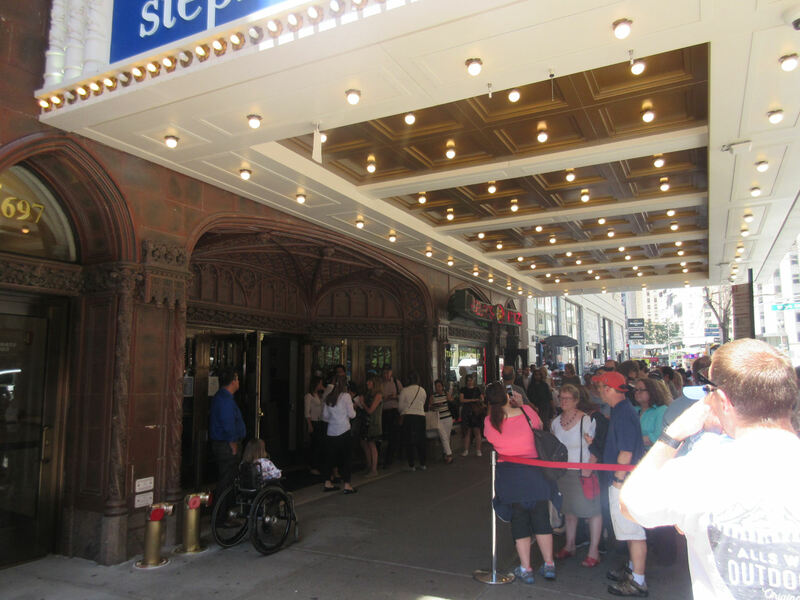 The antique doors of the Ed Sullivan Theater were so close, and yet so far. A bit after the line began moving at 2:00 toward a lady with an iPad and a stack of real tickets, we received our share (see lead photo from that previous entry) and found ourselves with a couple of hours to kill. 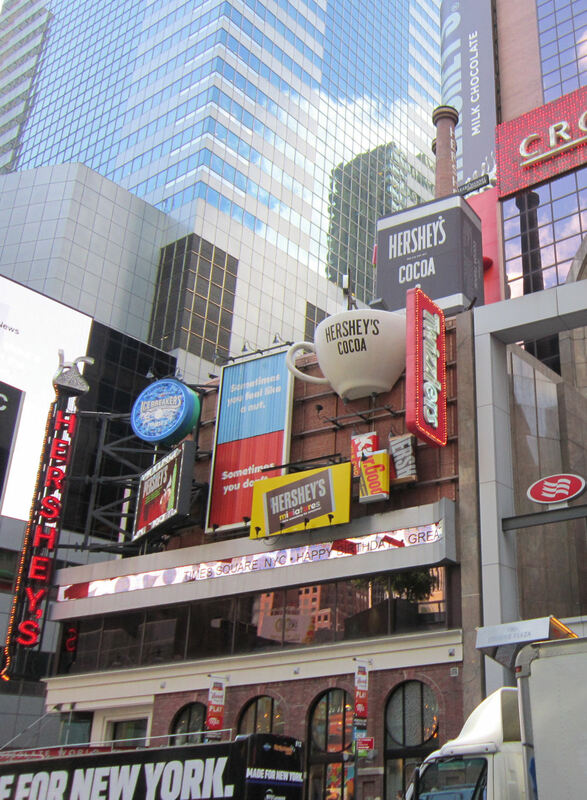 We were worn out from Chinatown and Wall Street, but our hotel was a bit farther away than we would’ve liked. 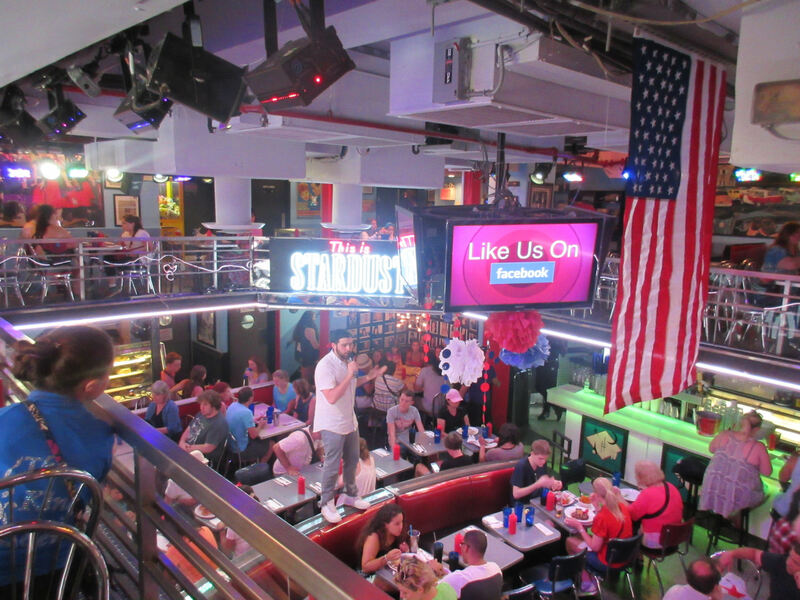 For attempted relaxation we headed south toward 51st Street and visited one of the second-tier stops on our to-do list: Ellen’s Stardust Diner. The outside retro stylings merely hint at the entertainment within. 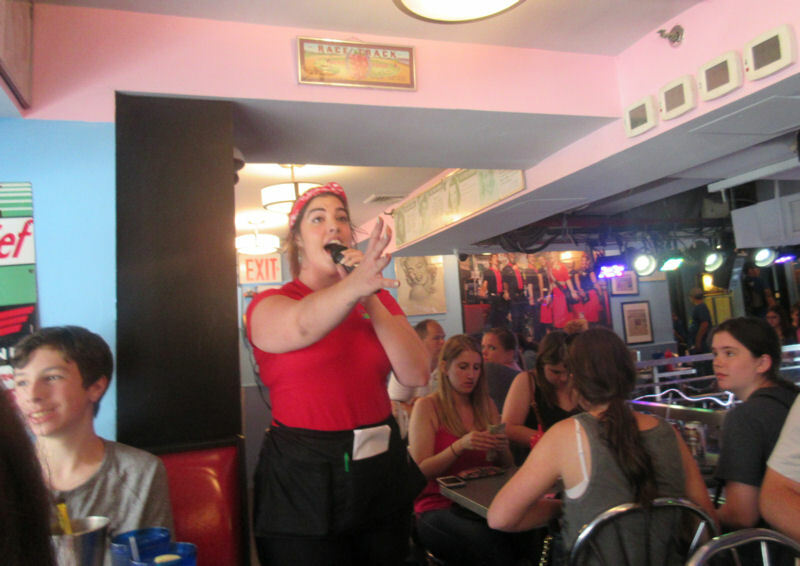 The restaurant’s major gimmick is singing waitstaff, a team of young Broadway hopefuls honing their craft at the top of their lungs while you’re trying to eat, talk, or think. 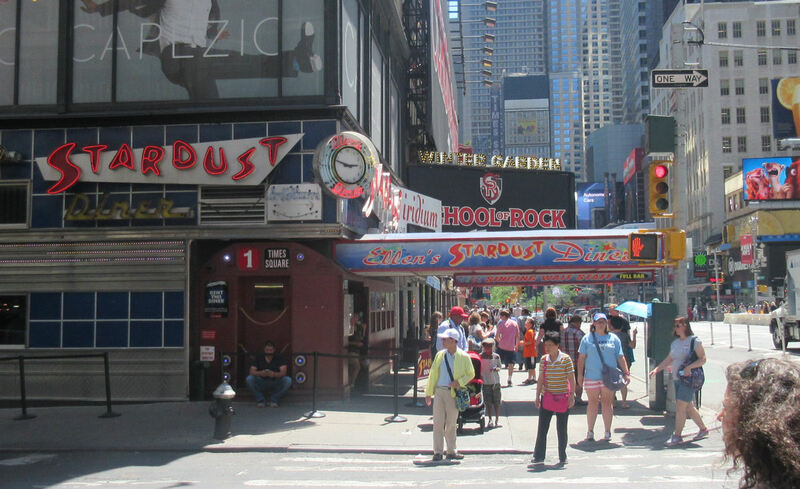 For anyone who loves the old, idealized, Hollywood image of New York City as a series of nonstop musical numbers, the Stardust Diner does their part to realize that image for at least one Manhattan corner. While we entered, an enthusiastic future starlet belted out “Pulled” from The Addams Family. The musical, I mean. The food was largely standard American diner fare and unfortunately made for an underwhelming second lunch. Anne wasn’t hungry; my son and his sandwich had issues; and my would-be order of yucca fries smelled, tasted, felt, and looked like the potato variety. Meanwhile around us, the strains of “Holding Out for a Hero” and a Moulin Rouge medley tried to encourage us to forget the food and enjoy the show. From our second-floor seats, we were thankful no one used the backs of our seats as impromptu mini-stages. We paid and tiptoed out during yet another ditty, then wandered down toward Times Square, which we knew would use up some of those unnecessary minutes before showtime. 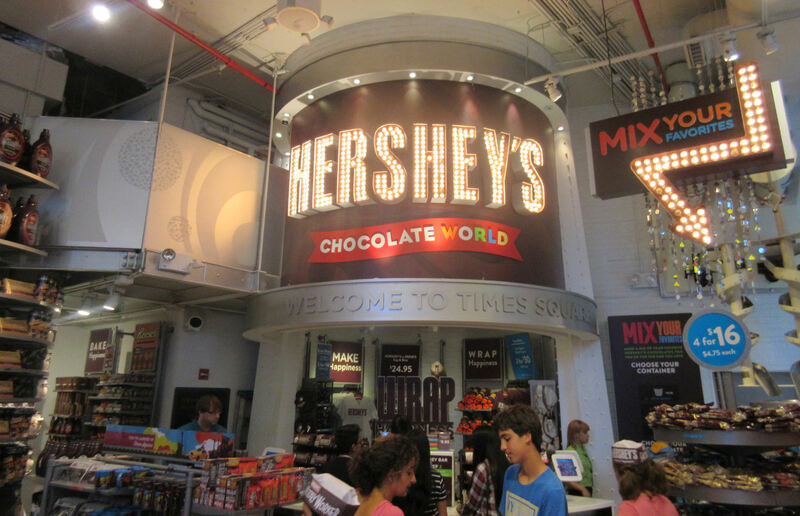 Among the usual array of neon lights, scintillating ads, aimless crowds, and cosplayers, we stepped inside Hershey Chocolate World for a few moments of air conditioning and sweet chocolaty scents. Heaven forbid any store along Broadway look like an ordinary Midwest strip mall. 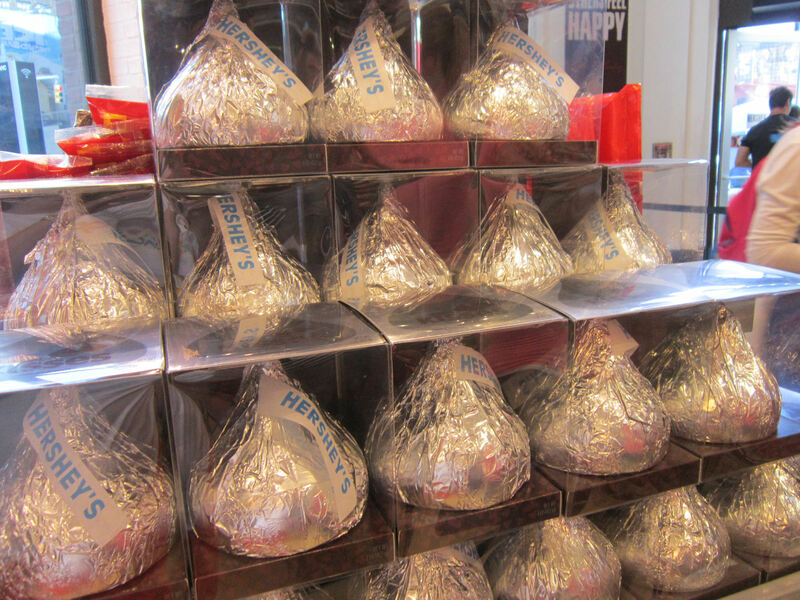 You can choose from a small section of creatively spiced chocolate bars, or buy megalithic versions of your time-honored favorites. On our way back to the theater, we were accosted by a group of wannabe musicians trying to hawk their demo CDs to anyone who’d brake for them. Remembering our contentious 2011 rap CD incident, we paused and humored them for a minute. I gave them a fiver and accepted only one CD with personalized autograph. Anne did the same but gave them a fake name. My son cut short one persistent sales pitch by taking out his wallet and proudly showing the zero dollars it contained. A few days after we arrived back home in Indianapolis, my son and I listed to bits of them in the car. Mostly just a bunch of aimless beats, very little in the way of vocals. Disappointing, 3/10 probably wouldn’t brake for again. …if you kept your gaze to the far right, there were the Goldens in our first TV appearance together. Despite our fifteen nanoseconds of fame, so far we have yet to receive a single reality-TV offer. That’s okay. We ain’t mad. We see how you are, Hollywood, pretending you’re finicky about your casting choices. Keep telling yourself that. You change your attitude, we’ll be here by the phone waiting for our plum roles in the inevitable “Too Much Exposition Theater” reboot. 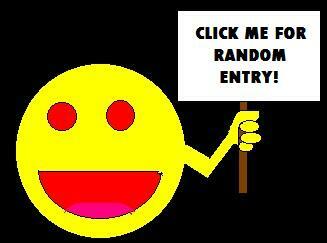 This is so fun!! I’ve never been to one of those TV shows/talkshow tapings. I guess now that I know it doesn’t seem that strange but I had no idea that sometimes they pieced together parts of different shows, like the musical guest on the aired version of the show you attended. Hmmm! To be honest, I kinda downplayed our discomfort at the Diner. The dissension in our ranks over whether or not to stick around for more than two minutes was the tensest moment of our week. 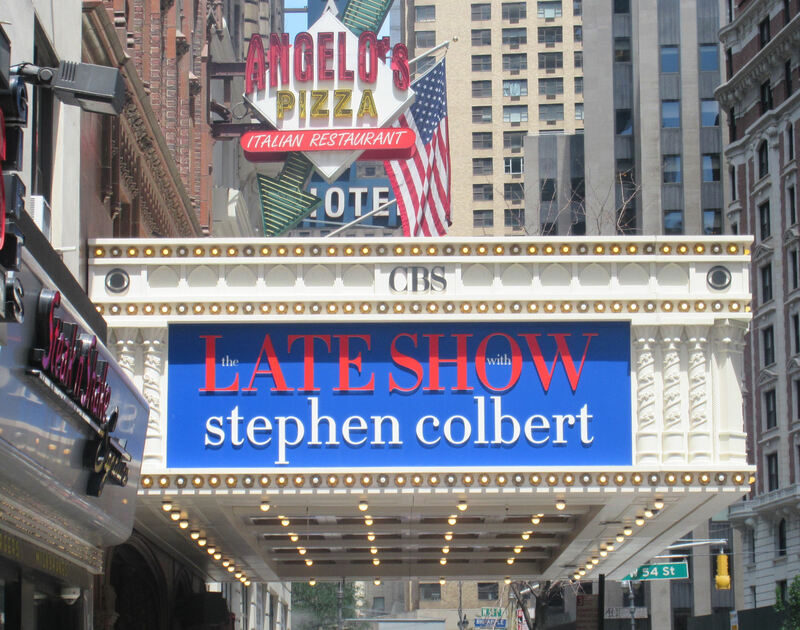 Our Colbert experience went a long way toward lightening moods, making peace, and rescuing the rest of the day. Yeah, the picture of the singing employee standing on top of the booth back-ahhhh, tooo much! Must have personal space with no feet near my head while I’m eating. Thanks for sharing the secrets of late night television I will forever view it differently.